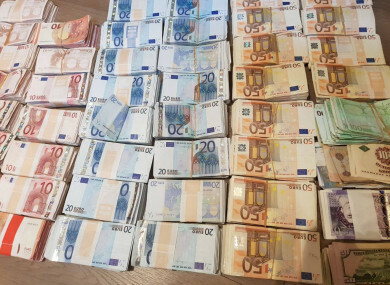 THE CRIMINAL ASSETS Bureau (CAB) and gardaí found €150,000 in cash and gold and silver coins during a search connected to fraudulent claims of over €3.5 million. The search operation took place in Cork City and Cork County this morning, at one residential premises in West Cork and two business premises in Cork City. The CAB investigation follows an extensive fraud investigation conducted by local gardaí in West Cork centering on fraudulent claims in excess of €3.5 million made under the Drug Refund Scheme. Approximately €150,000 in cash (including euros, sterling, dollars and foreign currencies) was seized along with a quantity of gold and silver coins (including South African Kruggerand coins). A number of safes are currently being searched. A quantity of documents (including title deeds for properties), and computer devices are being examined by investigating officers. No arrests have been made and the investigations is ongoing. Email “Cash and gold coins found during search over €3.5 million fraudulent claims”. Feedback on “Cash and gold coins found during search over €3.5 million fraudulent claims”.